What happens to the kids that don't get into their dream schools? The ones who aren't protagonists in overly gossiped and embellished college success stories, the ones who have the "meh" stories. Facebook has permanently inflamed the college process for teens, adding salt to an already stressful injury. There are two catalysts to this issue: an increased amount of pressure for kids to succeed and our society's much discussed obsession with social media. Now I know these sound like first-world problems; if rejection from a dream school is the worst event an 18-year-old has gone through I'd say they have lived a happily stable life. But that doesn't mean this is a non-issue. I personally believe that competitive high schools sometimes put business before students' happiness. A huge selling point for private schools with large price tags is their college matriculation list -- a list of colleges where graduates have attended in recent years. Elite schools' matriculation lists are strewn with top colleges that would impress anyone. Because schools overly emphasize college matriculation it seems like the end of the journey. For the high school, their job is done; if they package you just right with all the right community service hours, sports, and grades and you get you a big envelope in the mail, it's a success for them. I do not say this to vilify high schools, it's understandable that they have to market themselves to some extent. This doesn't mean I haven't had some of the most well intentioned teachers who want the best for each student. But because we are conditioned from a young age that college is the end of the story, many seniors including myself are left feeling doomed if the college process doesn't work out in their favor. Kids my age, and sometimes I, forget that graduation is called commencement. Commencement is the beginning or start of something, not the end. Yet with so much ahead for an 18-year-old, if you aren't going to a school that would be a bragging point or impressive car bumper sticker it's easy to already feel disadvantaged. We forget that when you read a successful figure's Wikipedia page, whether it be an actress, author, or politician, their bio so rarely starts with achievements from any time close to their teenage years. As much as I feel like an adult, I'm not. Maybe in some other culture I would've been married by now, considered an old maid being single at 18, but where I am now I am lucky enough still be able to be financially and emotionally dependent on my parents. Being 18 is the oldest I've ever been, and even as I try to be mature and look past high school frivolities, this is my life. You can't blame a teenager for getting wrapped up in the process, especially with Facebook. Around mid December I received a deferral letter from a top college I fantasized about since sophomore year. This school has a single digit acceptance rate, so statistically this was understandable, but my fantasy world at that school was immediately imploded by this news. I wanted to be mature ("Be cool Cameron"), I shed a few tears but I tried to remain calm. I asked myself what to do to distract myself, so I obviously signed onto Facebook. I knew this was a bad move, but I still decided to scroll through the meaningless junk of my social world. Just as I predicted, every three posts on my news feed were a status saying INSERT IMPRESSIVE COLLEGE NAME HERE CLASS OF 2019!!!!! Each status gained anywhere from sixty to several hundred likes. Every post stung, but I couldn't not look. Of course there were people I was happy for, but I'd be lying to say that even my closest friends' college statuses didn't burn. 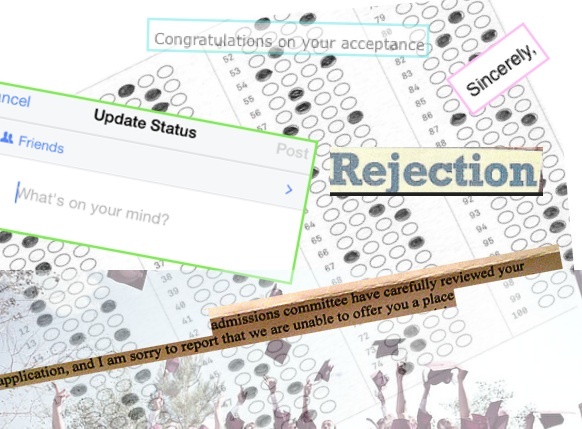 Man did I want to be in the accepted students club. I remember a conversation I had with one of my close friends as we were discussing our top choice schools. This was months before applying. Before she was even into her number one school she was already tinkering with pun-ny ideas for a Facebook status to announce her acceptance. Don't get me wrong, she's an incredible young woman and it's not even extreme of her to have this thought -- most teens would get it. It is the wildest thing that each teen with a social media profile is acting as their own PR agent, meticulously choosing the right pictures and captions to portray a happy, popular, active, and well adjusted life. I remember hearing about an older peer being miserable at their college and figuring out the possibility of transferring. "Funny", I thought, because each weekend her posts on Facebook and Instagram showed her having the time of her life, a life filled with the coolest friends, craziest parties, and extreme school spirit. The posts unsurprisingly didn't show her feeling out of place and stressed out. Teens are experiencing the pressures of celebrity, fighting off anonymity, appearing happy, and always looking put together. But we aren't celebrities, we are kids. I wanted a platform to connect with far-away friends, not an immense amount of social pressure. Another scary aspect about Facebook's involvement in the college process are online social groups. Kids join accepted students groups and post in them and connect with people, most of my friends have found roommates this way. Part of me understands how scary all the change of college is. I went to sleep-away camp at a young age and attended boarding school for the first time when I was 13, so I'm used to living away from home. But for most kids this is their first time moving out, their first time switching schools, social worlds, and settings. So I can imagine the comfort in connecting with people. But how "trippy" is that, knowing someone's profile before you know them?! How can you choose someone to live with in a tiny dorm room for a year based on how many likes they get? What if you get to school and don't even like these people you invested in? What ever happened to the college meet-cutes? You know, the whole picked-up-their-pencil-the-first-day-of-class-and-"we've been friends ever since" business. Why are kids entering college already knowing everyone? To be honest, all these phenomena I just ranted about don't even seem that crazy until I step back and think about it. There's always been pressure on students to succeed. The world shouldn't be asking kids what college they want to go to, rather adults should be more curious about an adolescent's dreams and character. When did making a status for hundreds of people you don't know become the new way to announce where you'll be spending the next four years? Is a college sweatshirt not good enough? I don't think Zuckerburg ever intended for this. It's not Facebook's fault, but the site certainly inflates the issue. We all need to remember that college is what you make it. You won't automatically be happy because of the impressive school you got into. It's important to separate online profiles from who people actually are, and to remember that college is a dive no matter what. Letting yourself make friends the old-fashioned way may be scary, but it's so often worth it. It's so much easier said than done, but take a breath and step away from the college process and computer. Think about yourself as a person, not the phony person you acted like in your Common App essay, but a real individual. Every process or journey has a million different turns, but rejection isn't the end. Besides, my generation will all be drowning in student loan debt long after we see our first acceptance letter.